On July 16, 2005, Bev Bettridge and her dog Summer made Canadian history. On that warm summer day in Southern Ontario, Summer earned her third Canadian Junior Hunter (JH) leg, to become the first American cocker spaniel to earn a JH title in Canada. Summer had already earned her US Senior Hunter (SH) title at that point, so she was no stranger to the field. But that doesn’t make the event any less momentous. For a dog to earn a Canadian JH title, the dog must find, flush and retrieve to hand two birds. Steadiness to wing and shot is not required at this level, however the dog must be steady at the water and retrieve a bird from a distance of between 25 and 50 meters. Summer earned this title with three straight passes and was the only dog to qualify for her first Canadian SH leg the following day. Summer was the one of a small number of American Cockers entered, out of a total of fifteen dogs. Summer's official name is Thomas' Lil Miss Summer Can JH, Am SH. Bev purchased Summer from hunter and breeder, Jeff Thomas, when she was just a pup. At that time, Summer had already been exposed to bird wings and she was showing signs of being a good working dog. Bev wanted Summer for several reasons. First of all, her sire is an accomplished performance dog with titles in conformation, agility, obedience and field work. Her dam comes from the famous Dungarvon lines, so she has hunting ability going back many generations in her pedigree. And Summer’s uncle just happened to be Bev’s first hunting and performance dog. Bev got her feet wet training and working with hunting dogs when she got Raven - Can Ch OTCh Skyrocket's Northern Knight Am SH, WD. Raven earned his Senior Hunter title with relative ease, even though Bev had never trained a dog for field work before. She was fortunate to have the Central Ontario Spaniel Club within driving distance. However, the COSC trainers primarily work with springer spaniels, so Bev still needed some online mentoring from people who know what makes American cockers tick. Bev was never able to steady Raven, due to making some beginner mistakes, so he is not suited to trying for a Master Hunter (MH) title. However, Bev hunts with Raven on a regular basis and gets to show off his talents to mainstream hunters - who never cease to be impressed by his talents. As a puppy, Summer competed in two cocker field trials in the United States. In New York, she earned a fourth place ribbon and in Michigan, she earned two first place ribbons. These field trials are challenging as the dog must not only be a solid worker, but a very flashy worker as well. The dogs get marks for getting the job done and doing it with style. This is different than with hunt tests, where the dogs are simply graded for getting the job done efficiently and correctly. Summer earned her American JH legs in the summer of 2004, starting her hunt test career off with a leg at the ASC Summer National in Indianapolis. She followed that up with two JH legs in Tonawanda, NY and her final leg in Maryland. She also earned her first SH leg in Maryland, at the tender age of 17 months old. In the spring of 2005, Summer earned another SH leg in Pennsylvania and the last two legs at a hunt test in Conneticut. Bev says that earning a hunt test title in Canada is quite difficult because of the scarcity of the tests. There are very few spaniel hunt tests offered in Canada, and the country is quite large, so distance is often an issue as well. The requirements for earning a hunt test title in Canada are also more difficult than the requirements in the United States, so that adds to the challenge. Just as it is in the United States, a person and dog team must travel a number of hours to get to the hunt tests, which can also make it a costly proposition, especially with the rising cost of fuel. Bev has found it very challenging to train for and compete in hunt tests. Prior to acquiring Raven, she knew nothing at all about hunting and there were very few people training American cockers to hunt at that point in time. She says that watching her dogs working the field brings a joy to her heart that is difficult to match. They aren’t big dogs, but they don’t know that and she says that they even project that image to her. She even finds herself calling Raven "Big Guy". Bev and Summer are continuing on the path towards a MH title. They have done several trials so far in 2005. Although Summer has yet to earn a MH leg, Bev says that they have never stopped learning and that every trial has offered her a new insight into working with her dog. 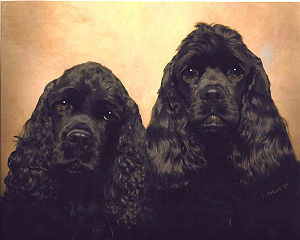 Summer and Bev are incredible ambassadors for the American cocker spaniel and I can’t wait to hear that they have earned that MH title in 2006! Kelly Ladouceur has been involved with American cocker spaniels for eight years now. She started off with a rescue dog that she trained for obedience and agility, and she never looked back. She is currently involved in conformation and obedience, with hopes to start doing therapy work again in the near future. Kelly is a regular contributor to Dogs In Canada and Cocker Classic magazines.